Careers in construction vary wildly, ranging from general labor through skilled trades positions to more advanced degree careers. Deciding which construction training program will be the best for you can be challenging due to all your choices. 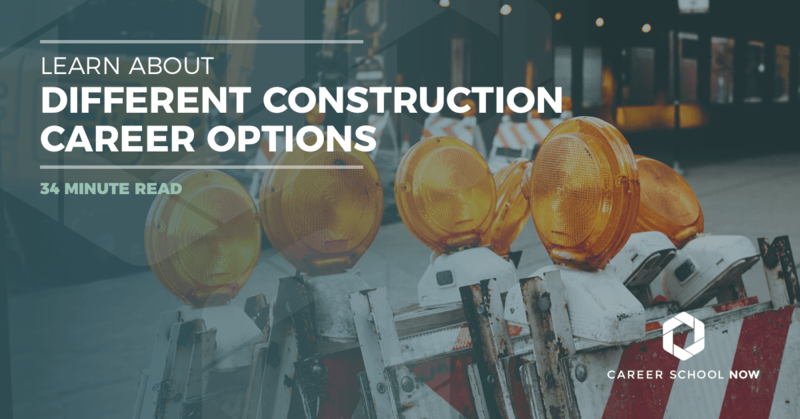 Learn more about all the different construction jobs to help narrow down your choices. Most of the following careers can also be entered through an apprenticeship. Blasters are employed within a good-sized handful of industries, from mining to military to construction and more. Blasters, also called explosives engineers, strategically use combustibles to loosen organic materials around construction areas. The job has the risk of danger and can be strenuous, so you’ll need to have both emotional and physical strength—plus a taste for adventure. You’ll work outdoors and may frequently travel to job sites near and far. For some positions, a college degree is not necessary. However, there are programs available in explosives engineering, and it’s highly recommended you consider going to school. Many roles in mining, construction, and demolition require a bachelor’s in engineering, mining, or construction. Alternatively, you can also work as an apprentice under a journeyman blaster for a minimum of two years. It can take up to five years to become a journeyman blaster. Each state has its own licensing and certification requirements for explosive engineers. To work in the mining industry, where the majority of blasters are employed, you’ll need a certification from the Office of Surface Mining Reclamation and Enforcement (OSMRE). Transporting any explosives requires a license from the Department of Transportation and the Bureau of Alcohol, Tobacco, Firearms, and Explosives. Either enroll in trade school or community college and get a degree, or become an apprentice. It takes up to five years to become a journeyman blaster. Get licensed per your state requirements. You will earn an average annual salary of more than $52,000. However, your salary will be very dependent on your experience, industry, and geographic location. Employment growth for blasters is slower than average between now and 2026. Brick masons, also known as bricklayers, are the highly trained people who build and repair all types of brick and stone structures, including buildings, bridges, and patios. The field lets you specialize; there’s three main areas of masonry. Bricklayers build and repair walls, floors, chimneys, and more. Pointing, cleaning, and caulking masons repair brick on older structures. Refractory masons install a variety of bricks for industrial purposes. The materials that brick masons work with have newer technology allowing them to be used in more extreme weather conditions, so brick masons jobs aren’t as restricted by weather. To be an excellent brick mason, you will need to have above average algebra and geometry knowledge. You should also know your way around blueprints and how to create your own technical and mechanical drawings. You should have no problems reading, solving, and interpreting measurements. And you should be strong, because those bricks can get heavy. The educational requirements necessary to begin your career as a brick mason are as follows. Train through an apprenticeship or enroll in a technical school program. Your apprenticeship will take three to four years and include 144 hours of classroom time plus 2,000 hours of paid on-the-job training hours. Credits that are earned from apprenticeships can be applied toward associate degrees. Some contractors host their own apprenticeship programs, while other apprenticeships can be found through unions. Brick masons earn a median annual salary of $42,900. The lowest 10 percent of brick masons made almost $27,000 per year, while those in the top 10 percent brought home over $76K annually. The employment opportunities for brick masons is projected to grow 12 percent through 2026, which is much faster than most other professions—the population is increasing and more structures are needed to accommodate the growth. Are you highly organized, exceptionally responsible, maybe a bit on the bossy side, and have a desire to work in construction? You could be a great construction site manager. You visit job sites to oversee the budgeting, the hiring and firing, inspecting contracts, creating the schedules, and meeting with other vendors or professionals connected to each construction project. To become a construction site manager on large projects, you will need to get a bachelor’s degree in construction management, architecture, engineering, or construction science. An associate degree plus experience can have you managing smaller-scale builds. Both degree levels will teach you to price costs, read construction plans, work with related professionals, and write contracts. Most bachelor’s degree programs have internships that are part of the coursework. Through the construction-related internships, you’ll gain some hands-on experience and insight into the inner workings of building sites. Once you snag that bachelor’s degree, and before you can work as an actual site manager, you will need to gain up to five years of work experience. Enroll in and complete a bachelor’s degree program. Get those five years of work experience in. Although certifications are entirely voluntary, hiring managers do prefer them. Certification designations are available through quite a few different sources. The American Institute of Constructors and the Construction Management Association of America are two of the larger certify bodies. However, to be eligible for certifications from these particular organizations, you must not only have construction work experience, but you also need to have four years of management experience, as well. Construction managers make an average median salary of $91K in 2017. The top 10 percent of construction managers earn more than $159K annually. Employment for construction managers is expecting an 11 percent growth through 2026. Construction and building inspectors check to see if structures meet code requirements to ensure they are safe for inhabitants. You will not only inspect homes and buildings, but you will also make sure that industry standards are met on bridges, water systems, and highways. Get your associate degree in building inspection technology. Every state has its own licensing requirement. Find out yours and fulfill it. Most states do expect you to have a certain level of education, on-the-job experience, and liability insurance. Renew your license in accordance with your state’s expectations. Some states have state-specific licensing. Others require certification through various related organizations such as International Code Council, the International Association of Electrical Inspectors, and the National Fire Protection Association. The national average for annual salaries of construction inspectors is $59K. The highest 10 percent earn more than $95K. Employment for construction inspectors is projected to see a growth of 10 percent through 2026, which is faster than most other occupations. Job growth for inspectors within the government sector is expected to be the strongest area. Having certifications in multiple areas, along with construction experience and a degree or certificate will help job prospects. To keep any building and its grounds in good condition, there must be a certain degree of maintenance. As a building and property maintenance contractor, you are hired to fix and maintain anything that needs, well, fixing and maintaining—from flower beds to leaky toilets. You should have outstanding troubleshooting skills: Being able to quickly identify problems and efficiently take care of them will make your days easier. You’ll work with both power and hand tools, and you can expect to be needed at any hour of the day or night. Although there are no educational requirements aside from a high school diploma or GED, it’s a good idea to have some formal training when considering a career as a building/property maintenance contractor. Certification programs are available online, through a trade school, or at a community college. Apprenticeship programs are an option as well. Property maintenance apprenticeships can last anywhere between 1-2 years with around 300 hours of technical instruction. Licensing requirements vary by city and state. Consider either a certificate or degree program at a trade school or community college. You can also consider a building and property maintenance apprenticeship, which typically lasts between 1-2 years for 300 hours of technical instruction. Each city and state has its own licensing requirements; be sure to find out yours. The average median salary for building and property maintenance contractors is $36,940. The top 10 percent earn more than $60,000 per year. The employment outlook for property maintenance contractors is 8 percent between now and 2026. This is right in line with most other occupations. Flooring installers and tile and marble setters are trained and certified professionals who install and finish flooring in every type of building, from new construction to existing structures. Flooring installers, along with tile and marble setters, remove old flooring, lay and level subfloors, and install new materials. Work with linoleum, hardwood, carpet, tile, stone, marble, and many other products. You need to be in decent physical shape to perform the necessary work. You should have excellent color vision and be good with details to easily see variances in tiles. You must have strong customer service skills; you’ll be in customers’ homes, so some level of respect, courtesy, and communication are necessary. Installing floors of any type can be physically demanding, particularly on the knees and back. Safety goggles and knee pads are the most commonly used protective gear in flooring installation. Strength and stamina are both needed when working as flooring installers and tile setters. You’ll be lifting and carrying heavy materials, and you need to physical endurance to remain in one position for extended periods of time. Since there is no true educational path, most people start out in an apprenticeship. Complete your apprenticeship, which should take between 2-4 years. It will include 140 hours of instruction per year, and 2,000 hours of paid, hands-on training. Flooring installers and tile setters earn a median annual salary of $40K. Entry-level flooring installers and tile setters made a salary of $23K. The top 10 percent of flooring installers and tile setters brought in more than $74K per year. Apprentices earn around 50 percent of average annual salary, and pay goes up with experience. Employment growth for flooring installers and tile setters is expected to be 10 percent through 2026. This means that jobs are supposed to remain steady, with no major growth or decline. High turnover in construction will create job openings for flooring installers and tile setters, but construction is always reliant on the economy. So as long as buildings are still being built, and old ones are being repaired and remodeled, there will be a consistent need for flooring installers and tile setters. Concrete finishers, also called cement masons, place and finish concrete for a variety of construction projects. You will complete tasks such as making concrete beams or columns, or you may have to pour cement for new sidewalks or driveways. Much of your work is done outdoors, which makes your jobs seasonal; though, there are new materials that allow concrete to cure at lower temperatures, letting you to work in more types of weather than ever before. Good hand-eye coordination is a must when working with concrete: You have to be able to tell if the concrete application is smooth. You’ll need basic math skills; they are a must when working with mortar, especially when having to mix it. You’ll be lifting heavy bags of mortar and applying constant movement when laying concrete, so you’ll need to be in peak physical condition. It’s no easy task. There are no specific degree requirements to becoming a concrete finisher. However, you must be 18 years old and have a high school diploma or GED. High school math and a mechanical drawing background will help you do well on the job. Most concrete masons learn their trade through apprenticeships, which can last between 3-4 years. With apprenticeship training, there are at least 144 hours of technical training, and around 2,000 hours of paid on-the-job training. During the apprenticeship, construction basics such as blueprint reading, math, building codes, and safety are taught. Optional certifications are available through the American Concrete Institute (ACI) and they must be renewed every five years to remain active. When the apprenticeship training has been completed, concrete finishers are considered journey tradesmen and are capable of going out on their own. Masonry workers, including concrete finishers, make an annual salary of $45K. The lowest 10 percent of masonry workers earn more than $26K annually, while the top 10 percent make over $74K per year. Apprentices earn roughly 50 percent of what journeymen masonry workers make, but their pay increases as their skillset does. The employment change for masonry workers is expected to increase 12 percent through 2026. The faster than average growth is due to the rebuilding of our nation’s highways and roads, bridges, factories, and residential housing increases. Construction equipment operators drive bigs trucks and operate heavy machinery on construction sites. Vehicles like bulldozers, excavators, and trucks are used to move building materials and debris. Construction equipment operators do not necessarily work a 9-5 shift; you may have to be on the job at night or during the weekends. You’ll operate your equipment in all weather conditions. You need to have excellent hand-eye-foot coordination if you want to operate any heavy machinery. You need to have a steady hand and just as steady of a foot to control those trucks. Being in top physical shape and able to lift more than 50 pounds is a requirement. Mechanical skills are of vital importance and part of the job duty because you won’t just be driving these machines, you may also have to repair them. There are two different ways you can become a construction equipment operator: vocational/trade school or an apprenticeship. Here are the steps you need to take. You need to be physically fit and have a driver’s license. You must be 18 before you can apply for trade school or an apprenticeship. Trade school programs last between 8-24 weeks. You will still need to find an apprenticeship or on-the-job training program after completion. Apprenticeships last three to four years and include at least 144 hours of technical training plus 2,000 hours of paid training. Continue your education to stay on top of the latest construction technology trends. Apprenticeships are found through unions—International Union of Operating Engineers being the largest—and contractors. A commercial driver’s license is often necessary, but that requirement varies by state or construction site. Your median annual salary as a construction equipment operators was $46K. Apprentices earn 60-70 percent of what fully trained workers make. Those in the top 10 percent of the field bring home an average of more than $81K per year, while the construction equipment operators in the lower 10 percent make more than $29K annually. The employment outlook for construction equipment operators through 2026 is expected to grow 12 percent, which is faster than the average for occupations. This is because more money is being spent on repairing our country’s infrastructure. The more types of trucks you can handle, the better your employment opportunities will be. Drywall is the most common material used to create walls within a structure. If you choose to become a drywall installer, you will cut and hang the drywall to create walls that, once taped and prepared, can be painted, wallpapered, or completed with any other form of wall covering. You will be part of the construction industry, working on the interior walls of both residential and commercial buildings. Because working with drywall wall can be physically demanding, you should be in decent physical condition, plus have good stamina. Heavy drywall panels have to be lifted and held in place for extended periods of time, so this career is not for the weak. You may also need to walk around on stilts, so good balance is a plus if you want to stay upright. Read our interview with a drywall expert—a day in the life. There is no formal educational path needed for becoming a drywall installer. You don’t even need your high school diploma or a GED—although, your high school math skills may come into good use. Even still, it’s always a bonus if you have some vocational or tech school training. The reason vocational school is recommended is because many potential employers are seeking to hire people who have had some basic education in the field. If you decide to go into a vocational program, find one that covers general construction courses like understanding blueprints, basic math, and drafting. These apprenticeships last 3-4 years, and then you can become a journeyman. Most states have a licensing requirement for contractors of any kind, so make sure to find out what’s required in your state. The median annual pay for drywall installers is $42K. Drywall installer apprentices make roughly 40-50 percent of what journeymen drywall installers earn. However, the rate of pay increases as experience increases. The top 10 percent of the drywall installer profession earn more than $83K. Through 2026, the employment growth is expected to show little change. However, new construction, remodels, and repairs will maintain the demand for drywall installers. Whether it’s cutting, fitting, or installing windows, skylights, or anything else glass-related in construction, a glazier is at the forefront. You will work in a variety of settings using all types of glass such as tempered, insulated, laminated, and specially treated. Glass is used in so many different areas of construction and so you’ll be specially trained to install the necessary types correctly, wherever necessary. Glass can be dangerous, not to mention heavy, so you need to be physically capable of lifting large pieces. To cut glass accurately, good eyesight and hand-eye coordination are important to your career. As a glazier, you’re sometimes in uncomfortable positions, holding or propping up pieces of glass, for extended periods of time, so balance and physical stamina are some good qualities to have. You need to have a high school diploma or a GED. Expect your apprenticeship to last four years. There will be 144 hours of classroom training per year. You’ll have 2,000 hours of paid, on-the-job experience per year. Once your training is complete, you are then a glazier journeyman. There are three certifications available through the National Glass Association. Only two states require glaziers to be licensed, they are Florida and Connecticut. However, certifications do increase the chances of career advancement, no matter which state you live. The median annual salary for glaziers is $42K. Those in the top 10 percent earned $79K. When you’re working as a glazier apprentice, you’ll be making 40 percent of what fully trained glaziers make. The expected employment growth between now and 2026 is 11 percent, which is faster than average for all occupations. More buildings are using glass for their exteriors, and this creates more job opportunities for your profession. Also, buildings and homes are being updated and repaired, including windows, doors, and skylights. You job may be affected by climate and economy, so you could experience times of unemployment. Buildings and their mechanical workings need help when it comes to maintaining temperatures. Enter the insulation worker or insulator. You will install insulation materials to help properly insulate buildings so they save energy in cold and hot weather conditions. Floor, ceiling, and wall insulators are generally employed in the insulation and drywall contractor industry. Mechanical insulators are usually employed through building equipment contractor industries. Both specialties need to be mechanically inclined in order to operate the machines used to install insulation. You will spend multiple hours at a time standing on your feet which can get exhausting, so you need to have good physical stamina. Also, dexterity and agility should both be in good working condition because you may have to cram into tight spaces. Basic math skills, measurement, specifically, are necessary when working as an insulator. When it comes to educational requirements, they differ depending on the specialty. For floor, ceiling, and wall insulators, there is some informal job training. You are given some instructions and then sent to work. If you are going to be using the spray insulation, you will be taught how to use the machine prior to being sent to the job site. For mechanical insulators, the requirements are more in-depth. You’ll enter a formal apprenticeship. Mechanical insulation apprenticeships can take up to five years to complete. You will have 1,700-2,000 paid on-the-job instruction per year. There will be 144-hours of practical instruction per year. Unions and contractors are usually the sponsors of these mechanical insulation apprenticeships. The only certification that is necessary is if the mechanical insulator will be handling asbestos, then they’ll need to take a course through the Environmental Protection Agency. Floor, ceiling, and wall insulators make a median annual salary of more than $37K. Mechanical insulators earn a median yearly paycheck of more than $45K. The Bureau of Labor Statistics reports that insulator employment growth overall should reach 5 percent through 2026. However, the job growth looks different by specialty. Floor, ceiling, and wall insulators are projected to see no increase in employment, while mechanical insulators will experience a projected 10 percent. The people who install, maintain, and repair the wires that keep our power and communications flowing are line installers and repairers, otherwise known as lineworkers. There are four main specialties of lineworkers: electrical powerline installers and repairers, telecommunications line installers and repairers, line installers, and line repairers. Although the different lineworkers may have different specialties, the one thing in common is that, without them, our lives wouldn’t function the way they do now. Power grids connect the electrical power lines to customers. It’s the electrical powerline installers and repairers that service the lines that connect to that power grid. Telecommunications line installers and repairers are usually employed by telecommunications companies to install and maintain cables for telephone, television, and Internet. Lineworkers can also specialize by duty: Line installers install the new cables, while line repairers maintain the existing cables. All lineworkers work with a variety of colored wires and cables, so you’ll need to have excellent color vision, no matter your specialty. You’ll want to form excellent mechanical, technical, and troubleshooting skills; these areas will be called upon multiple times a day. Heavy tools, cables, and equipment are part of the job, so lineworkers need to be physically strong. And because you may have to remain in the same position for extended periods of time, you should have a good amount of physical stamina. You need either a high school diploma or GED. Train on the job or through an apprenticeship, a certificate program, or in an associate degree program. Apprenticeships are the most common form of training for lineworkers and last three years. To obtain an apprenticeship, you also must have passed one year of algebra, a drug screening, and an aptitude test. Most apprenticeships combine coursework and on-the-job paid training. Some employers and unions offer these apprenticeships, so check with local businesses and unions about available opportunities. Certifications are available but optional. Electrical powerline installers and repairers earn a median annual wage of $69K. The top 10 percent make more than $99K annually, while the lower 10 percent made $37K per year. Telecommunications line installers and repairers earned a median salary of $55K. The top 10 percent brought home more than $85K annually. The lower 10 percent make more than $29K. Employment growth for line installers and repairs is expected to remain average, at 8 percent. However, actual job growth depends on the specialty. Telecommunications line installers and repairs will see little change in employment growth. This is because many households already have connectivity. Due to population growth and expansion of cities, employment of electrical powerline installers and repairers is projected to grow 14 percent through 2026. Some structures such as tall buildings, bridges, and roads require the reinforcement of iron to support them. Ironworkers make structures using steel, iron, or other materials which make the structures strong and sound. While ironworkers mostly build the new framework, they may also aid in demolishing or rebuilding existing ones. To remain safe on the job, because, let’s face it, ironworkers have a dangerous career, there are some qualities you need to have. You need a high school diploma or GED. You’ll enter an apprenticeship that will last three to four years. You will have 144-hours of technical training. You will also have 2,000 hours of paid training. Math, blueprint reading and sketching, general construction, safety and first aid will all be taught through the technical part of the training. Once you’ve completed your training, you’ll be considered a journeyman and no longer need to work under a more experienced ironworker. Certifications are optional, but very highly thought of. Many ironworkers do choose to become certified welders. Although certifications are not required, they do make you more desirable to employers and can create larger paychecks. There are two primary specialties in ironworking: reinforcing iron and rebar workers, and structural iron and steel workers. Both go through similar apprenticeships, but their pay is different. Reinforcing iron and rebar workers have a median annual salary of more than $46K. The highest 10 percent make a salary of more than $93K, while the bottom 10 percent earn over the $30K mark. Structural iron and steel workers brought home a median yearly pay of close to $52K. The top 10 percent earn more than $92K, and the lowest 10 percent make $31K annually. Apprentice ironworkers receive between 50-55 percent of what the journeymen ironworkers make. Apprenticeship pay grows with knowledge and experience. Employment growth for ironworkers is projected to remain steady across the board at 13 percent through 2026. In total, there will be approximately 11,000 new jobs available. Walls do nothing for aesthetics when they are bare. They need to be gussied up and made presentable. Painters and wall coverers have those poor naked walls covered. Whether it’s paint, stain, coating, or a variety of other wall coverings, you are just the person to take care of it. A word of caution: This trade has a high rate of illness and injury. Falling from ladders or straining muscles are just a couple of occupational hazards, which is why physical strength and stamina are important. You’ll also need the soft skills of excellent customer service, since you are usually working directly with home or building owners. And if you want business based on referrals, your people skills need to be perfect. Having good color vision is important as well. You’ll work with all different color paints and need to be able to differentiate between them. Complete an apprenticeship that lasts 3-4 years with 144-hours of practical learning and 2,000 hours of on-the-job paid training. If you do an apprenticeship and later want to get an associate degree, you can transfer the credits that were earned during your apprenticeship. Apprenticeships can be found through community colleges in conjunction with contractors or unions. Certifications are not required for painters. However, there is a painting certification available through the National Association of Home Builders. And for those wanting to work as an industrial painter, several certifications are available through the NACE International Institute and the Society for Protective Coatings. You’ll earn an average salary of more than $37K. The highest 10 percent make more than $63K annually. Starting pay for apprentice painters is between 40-70 percent of journeymen painter and wall coverers, but the pay increases with experience. Painters who specialize in bridges and other similar structures can earn a higher annual wage. Through 2026, employment growth for painters and wall coverers is projected to grow six percent, which is pretty much the average for all other occupations. The demand for painters will remain strong because people tend to enjoy changing the wall covering or color of their homes periodically. The employment of painters and wall coverers varies with the economy so some painters may experience bouts of unemployment. Gasfitters install pipes that provide natural gas to a variety of settings. Sprinkler fitters install and maintain sprinkler systems. Steamfitters install high-pressure and high-temperature steam pipes. There are essential qualities you should have when pursuing a career as a pipefitter. Savvy business skills, in case you want to start your own business once you have completed all the training requirements. Excellent customer service skills; you need to be polite and courteous and always remember that your best referral is word of mouth. Mechanical skills, because you’ll need to know which tools to use and when. You need to be a good problem-solver to find and fix problems. Get your training through an apprenticeship or at a vocational school or community college. Understand that even with a trade school program, an apprenticeship will be required. Complete your apprenticeship: Pipefitter and steamfitter apprenticeships take 4-5 years. Do the apprenticeship’s required 246 hours of coursework per year. Meet the necessary 1,700-2,000 hours of on-the-job, paid training each year. The majority of apprenticeships are available through unions, as well as some related businesses. Once apprenticeships are completed, pipefitters are considered journeymen and no longer need to work under someone with more experience. Some states do have certification and licensing requirements for pipefitters. Check with your state’s licensing board for information. Licensing is not usually required until apprenticeships have been completed. The median annual salary for pipefitters, steamfitters (and plumbers, who fall under the same category), is $52K. However, many pipefitters, steamfitters, and plumbers earn much more than average, with the higher 10 percent bringing in more than $91K annually. Apprentices earn roughly 30-50 percent of what journeymen make starting out. As they learn more, they earn more. Employment of pipefitters, steamfitters, and plumbers is expected to grow 16 percent through 2026, which is much higher than most other occupations. Driving the higher than average employment outlook is new construction and the updating of power plants and factories. Pipes burst, bathtubs leak, toilets overflow, and none of these can be permanently repaired by duct tape. Plumbers are trained professionals who can install and repair all the plumbing fixtures within a structure. You will work on more than one site in a day, so expect some travel. Also, expect inconsistent work hours because you will be on-call in the event of emergencies. Read more on starting a plumbing career. There are a few educational paths to consider if you’re thinking about becoming a plumber. You could enroll in a trade school and complete a one-year program. 2. You could enroll in a community college and finish a two-year associate degree. 3. You could find an apprenticeship (even if you’re taking one of the different school routes, apprenticeships are still required, though they will be fewer years in length). Plumbing apprenticeships are offered through unions and contractors. They last 4-5 years and combine classroom learning with on-the-job training. Apprenticeships also require on-the-job paid training: 1,700-2,000 hours per year. When your apprenticeship is complete, you will be considered a journeyman plumber and can work independently. Each state has its own licensing requirements, but most require plumbers to have a license. In most states, plumbers must have 2-5 years of work experience and should know all the local gas codes. It’s important to check with your state’s licensing board to find out more information. Plumbers can also become certified, which is highly recommended and sought after by hiring employers. The median annual salary of a plumber is more than $51K. This number is a national average and can look very different for each plumber nationwide. Apprentices earn between 30-50 percent of journeymen salaries, but as they gain more experience, they make more money. New buildings and new codes will up the demand for plumbers and create more jobs. This is expected to drive the employment opportunities up 16 percent between now and 2026. Even in bad economic times, plumbers are still a necessity, because people will always find the money for running water. Roofers are a trained craftsperson who can install, maintain, and replace the roofs of residential homes and commercial buildings using a variety of materials. There are no strict educational requirements set for roofers. Many roofers learn the trade directly on the job. Others opt for an apprenticeship, which lasts three years. There are no licensing or certification requirements for roofers. Once the apprenticeship has been completed, you are a journeyman roofer and can work on your own. Most roofers work full time. However, depending on the geographic location, work may be seasonal for you. Starting pay for apprentices is between 50-60 percent of what journeymen make. The average annual salary for an experienced roofer is more than $38K. The highest 10 percent of roofers earn more than $64K annually. Employment growth is expected to reach 11 percent through 2026, which is higher than the average for other professions. Building owners who want to repair or replace their roofs will keep roofers busy, as will new construction needs. Well drillers are highly trained at finding locations to drill for water, gas, or oil. You are equipped to operate multiple types of drilling equipment to complete the task. You also will know how to repair and maintain the equipment. You will be in a career that is reported to have excellent job satisfaction and average job contentment. Most of your coworkers will be male; not many women enter this trade. If becoming a well driller is high up on your list of careers, then you need to know how to get there. You need an associate or bachelor’s degree to become a well driller. However, there are apprenticeships, which last 2-4 years. These take the place of a degree. Unions, such as the International Union of Operating Engineers, offer apprenticeships. Getting an Associate of Science in Well Construction Technology is a good path to becoming a well driller as well. Most states will require you to have a license. Check with your state’s board to find out more. Keep up with your continuing education for licensing renewal. Payscale.com reports that the hourly salary for well drillers in the United States is between $13-$25, with the average being $17 per hour. Yearly pay is between $33,000-$78,000. Payscale.com’s stats are found through responses to its surveys.